Nikon just announced that it is developing a 500mm f/5.6 lens with a Phase Fresnel element, which would make it only the second lens in Nikon’s lineup to have such a specialized component, the other being the 300mm f/4 PF. This indicates that Nikon is prioritizing low weight for the 500mm f/5.6, given that a PF element can replace multiple standard lens elements with one that is much smaller and thinner. No price, shipping date, or photos of the new lens have been released. The full name is the AF-S NIKKOR 500mm f/5.6E PF ED VR. 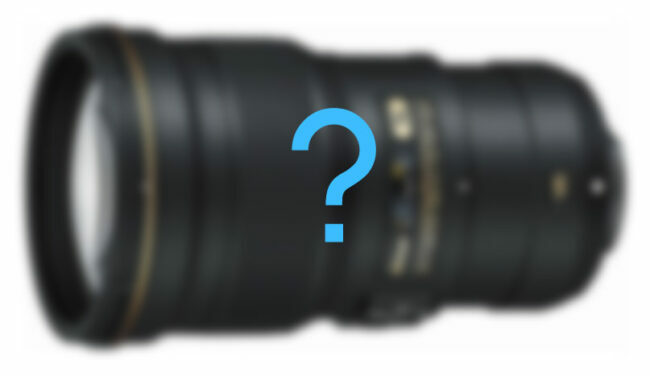 Although not much information has been released about the new lens yet, we do have a few hints at what the telephoto will be like, based on sources such as Nikon’s patent for a 500mm f/5.6 PF lens. The patent depicts it as 28 cm long (11 inches) with 19 lens elements. By comparison, the current 300mm f/4 PF lens is 14.8 cm long (5.8 inches) and has 16 elements. The 300mm f/4 PF sells for $2000, so you can expect that the new 500mm f/5.6 will not be a cheap lens. However, you can expect that it will be lightweight, at least for such a long telephoto. The 300mm f/4 PF still impresses photographers with its comparatively low weight, totaling only 755 grams (1.67 pounds). The older 300mm f/4, which does not have a Phase Fresnel element, weighs 1.44 kilos grams (3.17 pounds), almost twice the weight. There are also parallels between the new 500mm f/5.6 and Nikon’s most recent iteration of the 500mm f/4, which itself experienced a major weight reduction compared to its prior versions. However, the 500mm f/4 E still weighs a hefty 3.09 kilos (6.81 pounds). It also costs $10,300. (Though, as our review shows, the 500mm f/4 E is an exceptional lens.) Will photographers be willing to forego one aperture stop in exchange for, presumably, far less weight and a far lower price? It remains to be seen, but I certainly suspect that many will. Another Nikon lens worth comparing is the 200-500mm f/5.6. This lens also weighs a decent amount at 2.3 kilos (5.07 pounds) and, of course, zooms. As you can see in our review of the 200-500mm, it also decreases in performance noticeably at 500mm. For those reasons, the two lenses are likely to have somewhat different audiences. Assuming the new 500mm f/5.6 PF lens is sharp and comparatively lightweight, I can see people willing to pay significantly more than they do for the 200mm-500mm (which sells for just $1400). Spencer, this is a welcome news. I have the Nikon 600 FL ED lens and 300 PF, when I go in field, I tend to use 300 PF more than my 600 just because it’s light wight and easy to maneuver through vegetation and muddied field. If they release the 500 PF, I would certainly buy it just because it’s gives me lot more flexibilities. With newer sensor, the noice is not an issue so F5.6 aperture should not be a problem. Let see if they an keep the price of this lens under $ 4k. I hope you are right about 11 inch length, in that case it would be my most favorite lens!!! Agreed! I am planning to get a longer telephoto soon in order to do more wildlife work, and I will have a hard time deciding between this lens and perhaps a 300mm f/2.8. The price will be a big factor. I think you are right, $4000 or under would be good, but it’s hard to say where it ultimately will land. If the lens is 11 inches or so, that would be great! That info is only from Nikon’s patent application, so it certainly is not a final specification, but I’m optimistic it will be around there. I realize it is a price jump, but I would recommend the 400 f/2.8 over the 300 f/2.8, if it will be your main long lens. I have both. Back when I thought I would be able to get only one – ever – I saved up for the 400. Best choice I made because when you need reach, you need reach, and it can work well with all the TCs, as can the 300 f/2.8. It really comes down to subjects. If birds, especially the smaller ones are in your interests, then magnifying power is key. I waffled between the 500 f/4 and the 400 f/2.8. The later was the better choice for me, and it’s a great lens I love shooting clean, or with any of Nikon’s current TCs. Either the 300 or 400 f/2.8 lenses will be the sharpest long lens you have ever shot, especially if you check it for AF Fine Tune benefit, or not, and get the AF perfectly dialed in. This is especially key for adding in a TC, in my experience. This was also progress and outcome to a decision. Have had the 300 2.8G VRII since 2016. finally could afford the 400 2.8E. As you say, these are both superb Nikkors, including their ability to work very well with TCs. I also have the 300 f4 PF, an excellent compliment. So much so, it has has sidelined the 300 f2.8! Having recently attended a Costa Rica rain forest workshop and shooting hand held up into the trees with my Nikon 200-500 mm lens (mostly at 500mm) I will be one of the first in line to buy this lens! All of us Nikon users at the workshop had been speculating about this lens, and we all wished we had one. I currently own the new 500 F4 FL VR lens. It is an incredible len and much lighter than the previous version. I am able to hand hold it most of the times. However, there are times when I wish for a lighter lens. E.g. when I am trying to capture a bird in flight, the bird in question is perched on a tree and I am waiting for it to take off. Then the the weight of the lens starts feeling like a ton! Other occasion is when I have all my gear in a carry on backpack and 1. I try to convince the airline staff that it’s still within cabin baggage limitation (which it isn’t) 2.I am walking from from one terminal to other in a big airport. 3. When I am boarding a 10 seater bush plane in Africa with even stricter baggage limitations. I was actually contemplating a move to Panasonic or Olympus for the sheer weight advantage that they have over Nikon, Canon and Sony (yes!). This lens in spite of it’s slower aperture, still will be a very attractive proposition. I also wonder when Nikon will indulge APS-C shooters with lightweight DX lenses like 70-200 f2.8 and 80-400 f4-5.6. Physics works against lightweight DX lenses like a 70-200 and 80-400. Once you get beyond a certain point, typically 135mm, the primary objective of the lens is the determinator of the lens size. If you look at the Fuji 100-400 you’ll see it’s nearly identical to Nikon’s 80-400 or any other similar focal length zoom. There’s no sensor size advantage. 70-200 would be nearly the same. That’s why Fuji did the 50-140 2.8 which is nearly the same size. Whether mirrorless or smaller sensor, you rapidly get to a point of diminishing/vanishing returns as the lens gets faster. So the lightweight and lower price are mainly resulted from f/5.6, correct? And the Phase Fresnel is a bonus? Phase Fresnel reduces the complexity of the optical formula, thus reducing the amount of glass needed. The 1 stop slower also means the primary objective lens can be noticeably smaller. Both together mean less glass therefore lower weight and less expensive. It will be interesting to see how this one fairs. I have the current (and previous) 600 f/4 and it is my main lens, usually mounted with an FX body. The 200-500mm is a solid performer and typically has the D500 on it. This one would be interesting, and with the 1.4x TC yields 700mm, but will need a lot of light, or higher ISO to shoot. Should be interesting to see how the details unfold. I am personally a supporter of the 300 f/4 PF lens – Find it an amazing tool, that is my go-to lens for wildlife on a Nikon D7200, with the Nikon T1.4 added. The light weight means I actually have it handy, and can effectively handhold it. A 500 5.6 PF would likely be a “handholder’s” best friend. It is fine for others to say how a standard design might be just as sharp (and already in their lens collection), but it is the weight reduction along with quality of image that keeps me coming back to my 300 f/4 PF. Bring on the 500! I hear the desire for a lighter lens that is easier to handhold. That said, most of the images I see from people proud of their handhold captured shots are relatively soft. A person should shoot the combo on a tripod, with good long lens technique to evaluate what the combo is capable of. When posted web images are softer I can assure you that full file is quite soft – relative to what it would have been if shot properly. I spend enough time in the field to hear the list of rationales and excuses for shooting handheld. For, the results speak for themselves. I shoot handheld when I need to, but few have the skill to shoot longer lenses handheld and get sharp images. And, I have made multiple international trips, including three to Africa. Regional jets are a challenge, so lighter and smaller is desireable. That said, with some planning, it’s very possible to get to great locations without using the regional planes. The traditional wildlife kit was a 300 f/2.8, 600 f/4, 70-200 f/2.8 and TCs. Wider lenses if desired. Good tripod, beanbag, etc. and whatever other accessories a person preferred. In my experience, having multiple cameras with different lenses mounted is ideal, since cool stuff develops quickly and it’s better to be ready. That said, changing lenses, or adding a TC isn’t the issue some seem to suggest. Dust, unless you choose to change with wind, is not a practical problem, in my experience. I most certainly welcome the news that Nikon has capitalized on their industry lead in Phase-Fresnel technology. Only 3 years after the revolutionary 300 f4E PF appeared! The far better solution is a 400 f4 PF. Why? A more compact and affordable 400 f4 would sell, because it gives fiscal and travel budgets the wider versatility – in a single, extendable solution. The TCE [TeleConverter Factor] of a 400 f4E will give us a compact 560 f5.6 and 680 f6.3. At a push with hit on AF etc, we have a 400 f8. A 500 f5.6 with TC14 gives only a sluggish 700 f8. Too often outdoor photographers need the longer reach. Yes beyond 600mm: and with effective AF performance! Slow telephotos preempt this versatility. Many of who gratefully enjoy using the 300 PF in the field already own a most impressive 510 f6.3 PF. I also often use the TCE14 III is too often attached to my 300 PF. I also use the TCE 2 III with remarkably good results. For many of us, a 500 f5.6 PF had better have superlative IQ to justify its cost. The costs, and merits etc of this possible 500 f5.6 are complex however, and individual’s choices will see the 200-500 f5.6 as better and above all affordable. Nikon’s best-selling 200-500 is the budget entry into exotic telephoto territory, as is a Sigma or Tamron tele-zoom. All give one a remarkably good lens at the price but still heavy. My advice for wildlife shooters who fly to their sites is get the 300 PF with TCs on FX, and better a 2nd DX body ie D500, with the 70-200 f2.8E or more affordable 70-200 f4G. I often shoot the 300 PF (with or without TCs) on my D850 with the 70-200 f2.8E on the D500 – my mobile solution. My optimal solution for wildlife is the 70-200 f2.8E, 300 f4 PF and 400 f2.8E FL with TCs. Although the 400 f2.8 is 800g heavier than the 500 f4E, its top TCE of T3C4.5 has the performance edge (800 f5.6 with TC2 III) when I need longer reach. Prior to the 400, I relied on the superb 300 f2.8G with TCs. I often fly into Zambia and elsewhere in central Africa. This dictates the singular long lens solution…. So if it’s sufficiently light, I would grab a 400 f4 PF; what a wonderful accessory to the heavier 400 f2.8E. 500 f5.6 PF? Doubtful, which will be a pity! Nikon have been holding the Ace card with their PF technology. What a tragedy to miss the boat with a sluggish product that could be so much better. Basically, I’d like to chime in the give-us-a-lightweight-500mm-choir. However, so far nobody seems to remember the problems coming along with the 300 PF. I own it because at the time I bought it I was fed up with waiting for Sigma’s 150-600 Sports. I preordered minethe day it was released and it took Sigma months to bring it to market. Meanwhile the 300 PF was out and ready to ship, so I got mine. The only problem with the 500 PF announcement is that the lens will have to compete with the 300 PF + 1.4 TC. While I expect the 500 PF to be a bit better in contrast in sharpness (due to the use of the TC on the other) will it be *enough* to topple the other combo? 420mm vs 500mm. That 80mm is usually not significant in real-world use. It will also be a question of price. Will Nikon price this greater than the 300 PF + TC? If so, they risk losing sales unless there are characteristics of the 500 PF that outshine that combo. I’m glad Nikon is making this lens but I suspect a 600 PF as they patented or even a 400 f4 PF would be better for sales. I guess we will find out eventually. Noooo … because the 500mm with the 1.4 TC will be a good 700mm, much better than than the 300mm with 2x TC at 600mm. I will buy this new lens on day 1. Yes, but even with a 700mm f8 you’re largely constrained to static subjects or subjects in fairly bright light. I’d rather have a 600 PF f5.6. Or a 400 f4 PF would be great because you’d have a 560mm f5.6 option. (i) Demand for the full Pro telephoto primes (300/400 2.8 500/600 4) will remain unaltered (at a low level) as it has done for 30+ years because of their unique abilities. A 500 5.6 will not impact full-time wildlife photographers who will always want the F4, but a 600 5.6 might have dented the 600 4 a little given the massive size of the latter. (ii) Serious amateur wildlife photographers with cash (but bad backs) are increasing in numbers as people live longer and want to capture images of the fauna they view with their Swaro bins. A 500mm is perfect projecting a similar field of view to 10x binoculars. 600mm would be a little long, especially as many will be used on DX bodies. (iii) The 200-500 5.6 is a nice lens, but it is too heavy for many people, not razor sharp at 500mm, has awkward zoom ring and slow focus. (iv) The Canon 400/4 DO is a nice lens, but it does not compete with top-spec sports lenses on speed or sharpness, and is not long enough for wildlife and Canon have not achieved extreme weight saving with their Fresnel formulation. Hence Nikon have captured a niche without denting their duopolist buddies. 300mm F2.8vrii (no Fluorite yet, metal) 3kg; 300mm F4d (metal) 1.45kg (i.e. 47.5%); 300mm F4 pf (plastic) 750g (25% of F2.8). 500mm F4d (old pre-Fluorite) 3.9kg, therefore a non-Fresnel 500 F5.6 could weigh about 1.9kg (which is supported when you consider the 200-500 weighs 2.1kg without mount) and hence a Fresnel 500 5.6 could weigh as little as 1kg if it was made of plastic like the 300pf. More likely is more metal will be required compared to the 300pf, but 1.3kg is quite possible in my opinion. This would be an amazing option for those seeking lightweight wildlife lens, like the many retirees out there, who also don’t want to fiddle around with TCs. (vi) The pricing of the 300mm PF was £1500 at start, then increased to £1700 as Sterling weakened with Brexit. The 200-500 is around £1200. I don’t believe the 500 PF will be more than £2500 ($3000) because although the weight saving should be amazing, I don’t think people will pay much more than that for an F5.6 lens. Anyway, that’s my guess. What I hope is the VR is rock solid (not a bit flakey like on the 300pf), and the contrast levels are good in low light (where the 300pf also suffers a bit). Wow, this is interesting. I’m in the market for a new camera and lens combo and was going to go with the Canon 400mm f/4 DO II for compactness, but this announcement leaves me thinking about that. With Nikon’s cameras already providing many benefits over Canon’s, this might be a reason to consider Nikon for those times when you need something really compact.